In the third week of her promotional Apple Watch diary, posted Thursday, model Christy Turlington Burns made mention of a previously unknown feature of the wearable's Workout app that adjusts to a user's gait for more accurate results. Burns wrote that after running with the Watch and an iPhone "a few times," the app will adapt to a person's stride. This should ultimately produce more accurate results, something Burns suggested is especially important given the difference between running outside and on a treadmill. During the past week Burns was on vacation with her family in the Caribbean, but nevertheless took some time out to prepare for the London Marathon and shoot promotional photos. 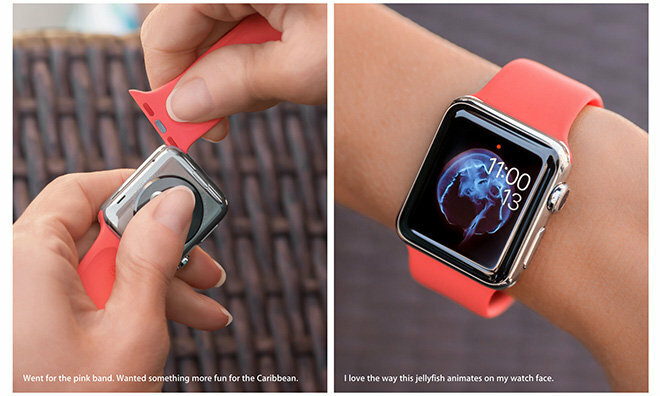 Images in the diary showed her switching to a pink strap, and using an animated jellyfish as her watch face. The diary otherwise described her relaxed training regimen, split between indoor and outdoor runs, tennis, yoga, and walking. She also mentioned filling the Workout app's Exercise ring "almost every day," and having to turn off notifications one afternoon in order to get a nap. One of Apple Watch's health features uses the Taptic Engine to gently tap users on the wrist to remind them that they need to stand once an hour. In the coming week Burns will be in Los Angeles, doing a 20-mile training run in preparation for London. Apple is using Burns and her marathon training to help build anticipation for the release of the Watch on April 24. She was a prominent figure during the company's March 9 press event, appearing on stage alongside Apple executives.